It’s not often that one finds themselves completely at home in a strange place, yet the streets and silhouettes of the city of West Hollywood (or WeHo as it’s affectionately referred to by Angelenos) feel intoxicatingly familiar and simultaneously seductive. My short stay is retreating hastily; as my plans over-flow in my mind, and I decide instead to take a more organic approach to discovering West Hollywood; each day as it comes. The residents of WeHo are blessed with incredible landscapes. The view from my voguish room at the Mondrian boasts a frame worthy view of the iconic Downtown skyline, but gaze up at the vista on the other side and it’s the prominent Hollywood Hills that behold you. On my first morning in West Hollywood, I venture away from the famous Sunset Strip in search of a WeHo breakfast. Other places to stay, in West Hollywood: Andaz West Hollywood, The Standard, Sunset Tower Hotel, Petit Ermitage. It’s difficult not to neglect the traffic lights here and weave through the abounding cars like a Londoner, when crossing the roads, but I’ve been cautioned extensively against jay walking in L.A (plus I’ve recently watched that episode of New Girl which delivers a sound lesson on the consequences of jay walking in Lala land, and I’m not willing to take my chances), so I gather all my patience and make like a sensible pedestrian. Built on a grid system, the streets in Los Angeles are easy to navigate, but this does portend an uneventful walk, if like me, you enjoy absorbing different facets of a place. So naturally, I take an unlikely route and find myself transported to a cleverly hidden city suburb. Tree lined streets, lush gardens and enchanting houses of various shapes and sizes paint these mysterious streets, where even the sound of the all-dominating cars is barely discernable. It’s in these little pockets of tranquility, it seems, that WeHo residents journey by foot, if only to walk their dogs. Emerging from the pretty hamlet, I hasten towards splendid Melrose Avenue and Urth Caffe, for breakfast. I’ve been told Urth Caffe does good coffee, which is of course my primary reason for choosing it as my breakfast destination, but its relationship with one of my all time favourite TV shows, Entourage, cannot be ignored and at that moment, I’m a complete tourist, basking in memories of notable episodes. The café is heaving with customers, the queue trailing outside onto the sunny terrace, but nobody seems to be in a hurry. The drinks menu extends far beyond a single menu board, which worries me somewhat; long coffee menus usually indicate a lack of coffee knowledge and quality, in my experience and I wonder if I’m about to suffer a Starbucks like brew as I place my order. My Italian cappuccino (I’m told this is stronger than the American version) wears a smile in the form of a coffee art bear – cute – and though it’s far superior to anything Starbucks produces, my palate is left wonting. Formerly known as The Avenues, West Hollywood’s newly named Design District follows Melrose Avenue and meanders over to Robertson Boulevard and Beverly Boulevard, scattered with trendy designer retailers, such as Stella McCartney, Philip Lim, Rag & Bone and Balenciaga, as well as purveyors of premium art and furniture. Unlike Rodeo Drive, WeHo’s Design District enjoys a warm and welcoming attitude (inherently West Hollywood), making for a pleasing window shopping experience. But if like me, you enjoy exploring the unknown; rummaging the wares at independent boutiques, thrift and vintage stores, you’ll find the stores towards and around the east side of Melrose Avenue a genuine treat. On the Sunset Strip, an alley prepared with a long table of diverse foreign fashion and design publications, coaxes me to take a gander. I travel to the very end and as I’m about to turn back, I glimpse a sign ‘Mystery Pier Books’ – I feel like I’m in an American version of Diagon Alley and of course, I must explore. In what appears to be a deserted house, resides Mystery Pier Books. A bell sounds as I enter the seemingly empty store and I’m alone in a room brimming with literature. I love book shops and this little gem is rather special. Every book at Mystery Pier Books is a first edition and many are signed first editions. I could spend the rest of my stay here and be quite content, though I think it’s best to refrain from asking the owners if they’d mind me camping out in their shop overnight. Harvey and Louis Jason are both passionate and knowledgeable about literature and books and Harvey graciously indulges me in conversation about writing fiction. ‘Do you have an agent,’ he asks, and embarrassed, I mumble that I’ve neglected my writing of fiction for journalism. As I leave, I promise to start writing the new novel that’s been marinating in my mind. Mystery Pier Books can also be explored online. Dinner is at Comme Ca and I’m running late. My cab driver has no idea where my destination is and I find myself Googling the directions. I am clearly not in London anymore. From the outset, the French restaurant appears slight, but as I walk inside, it seems to stretch indefinitely, teasing me in. My guest, a new L.A resident has heard great things about the restaurant and we are keen to delve into the menu. Our Penicillin cocktails are excellent, my French onion soup, with gruyere cheese lid, divine and the seared scallops, delicious. Combined with the superb service, Comme Ca makes for the perfect start to a night out with friends, in West Hollywood. Other great WeHo eateries include, chic Laurel Hardware, the refined Asia de Cuba at the Mondrian, Eveleigh, Night + Market. 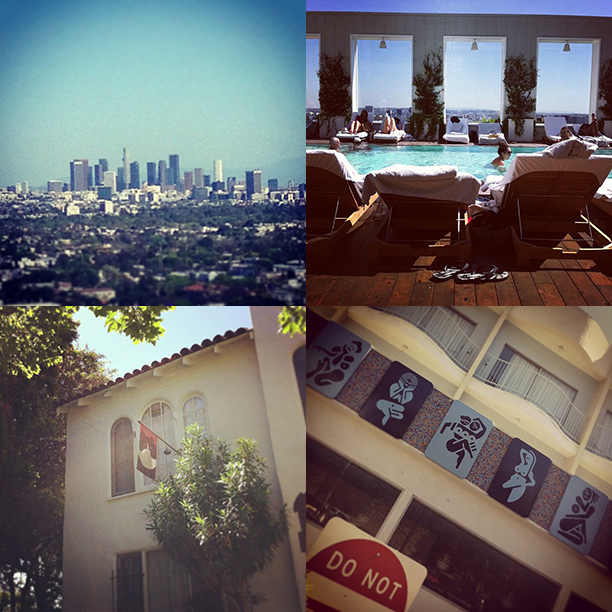 My next stop is the notorious Hollywood landmark, Chateau Marmont, lovingly referred to as ‘The Chateau’, by locals. This iconic hotel is a must see, if only to view its Gothic like visage, but its fame lies largely in its reputation for being the set of many a scene in Hollywood flicks and the host to the rich and famous. Inside, Chateau Marmont recalls old Hollywood Glamour, with its rich deco furnishings and dark ambience. My friends and I inhabit a table at the lounge bar, where we ask to see the secret menu. The drinks range from interesting to bizarre and we leave wondering if we’d have fared better with the regular menu. Chateau Marmont is also a lovely place for lunch (request to be seated in the garden) and weekend brunch. Other cool hangouts in and around West Hollywood: Skybar at the Mondrian, Drai’s, Tropicana Bar at The Roosevelt Hotel, House of Blues, The Roxy Theatre. I flew direct from London to L.A with Air New Zealand. Visit www.airnzealand.co.uk to book flights.